Introduction. The Nature of Legal Language. Legal Assumptions about Language and Communication. Ethnography and Experimentation. Speech Styles in the Courtroom. Controlling the Effects of Presentational Style. Conclusions. Appendices: Transcripts of "Powerful" and "Powerless" Styles. Transcripts of Narrative and Fragmented Styles. Transcripts of Hypercorrect and Formal Styles. Transcripts of Overlapping and Nonoverlapping Speech. References. Subject Index. With the permission of a North Carolina court, more than 150 hours of courtroom speech were recorded for this study. These tapes provided a rich archive for a variety of different types of inquiry, including the ethnography of courtroom speech and social psychological experiments focused on effects of different modes of presenting information in courts of law. 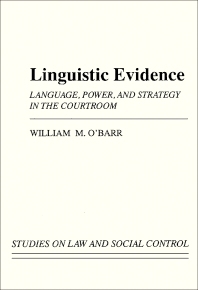 Four sets of linguistic variables and related experimental studies have constituted a major portion of the research: (1) "powerful" versus "powerless" speech; (2) hypercorrect versus formal speech; (3) narrative versus fragmented testimony, and (4) simultaneous speech by witnesses and lawyers. All four sets of studies focus on the central question of importance of form over content of testimony.